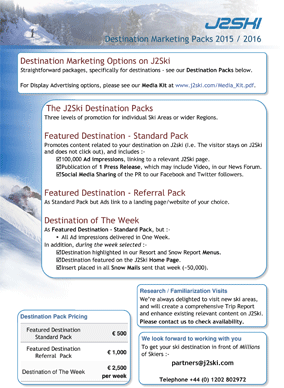 Why advertise your ski or snowboard business on the J2Ski Sites ? If you want to connect, directly, to the serious and independent segment of the skiing population there is no better place to do it. In the past twelve months we have served Six Million Visitors. During the 2016/2017 Ski Season, we served over 11 Million Pages during 5 Million Visits and confirmed our position as one of the world's Top Snow Sports Web Sites (ranked by traffic). You can see details of our 2014 / 2015 Ski Season Traffic Stats here. Our visitors find us through natural, organic search. We do not pay for inclusion in Search Engine results, or on directories and we never buy traffic. If someone arrives at our site, they do so either because they have made a very specific search (for information we can give them) or they have followed a link from one of the many sites who consider us worth linking to. Can your clients find you like they find us? In just One Month (e.g. 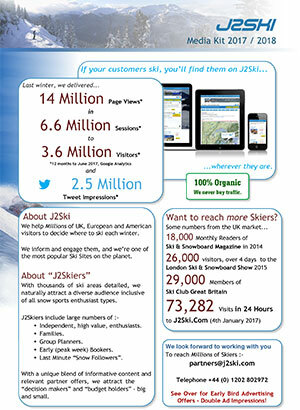 November, December and January), ski and snowboard enthusiasts visit J2Ski over One Million times. Google Ski Chat Europe #1 & #2 of 189,000,000! Our web site is over ten years old, and in that time we've grown from a hobby site to a reference point for the Independent Ski and Snowboard community. Without the use of paid placement or publicity, we've grown from a few dozen daily visitors, through an average of three thousand daily visits (January and February 2005), to regularly exceed FIFTY thousand daily visits in season. Free Listing in our Ski Site Directory, and easy options to promote your business across J2Ski. J2Ski are always seeking Headline Partners. If you represent a serious winter sports business and would like to work with a serious winter sports web site to raise your online profile, please e-mail us now.